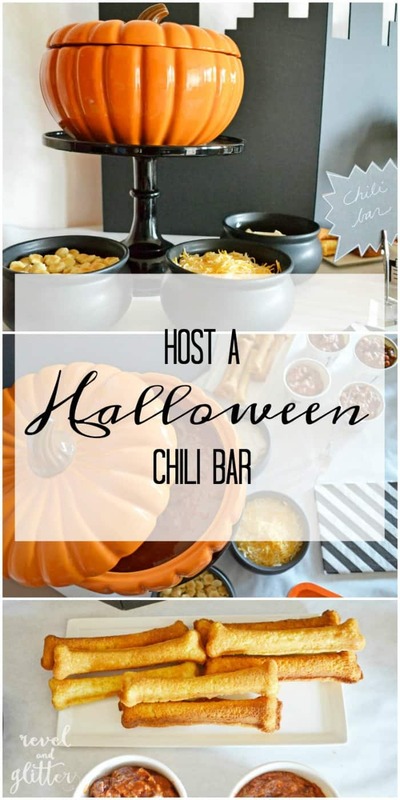 This Halloween Chili Bar post is courtesy of our contributor Dawn of Revel & Glitter…Need a warm and tasty way to feed a crowd (or just your crew) before trick or treating? 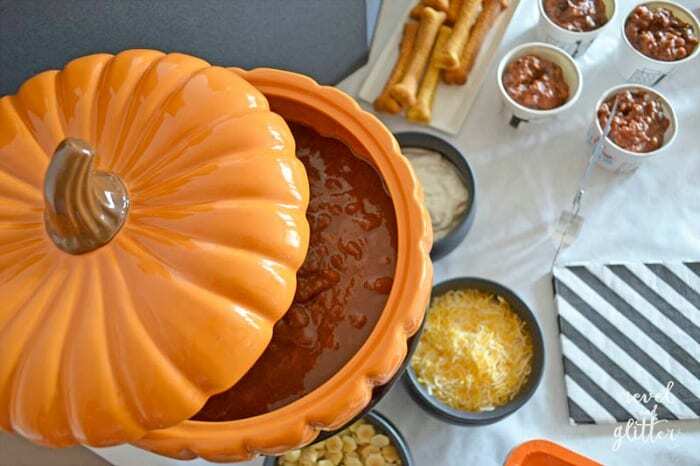 A crock pot of your favorite chili and all the fixins makes a perfect Halloween buffet on its own, or an add-on for your other party food. Not to mention keeping everyone warm while they are outside begging for candy. It’s been our annual tradition but this year will be a little different. Since we are sadly outgrowing trick or treating, I’ve invited my son’s friends over for dinner before they go zombie paintballing. Yup, we are having a chili bar! FYI, I am obsessed with my pumpkin serving bowl from Crate & Barrel. I don’t like to purchase themed servingware since I can’t use them all year round, but this will carry you all through fall. And at that price, you will want several! 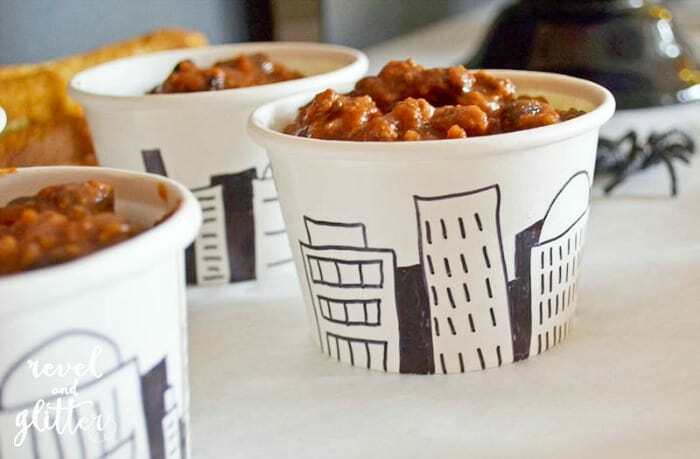 If you are feeding a crowd, cut down on your dishes by using wood utensils and paper tubs. I couldn’t find tubs that I liked that fit our theme so I drew on them instead. This is a great way to personalize them; you could also write your guest names so they can keep track. 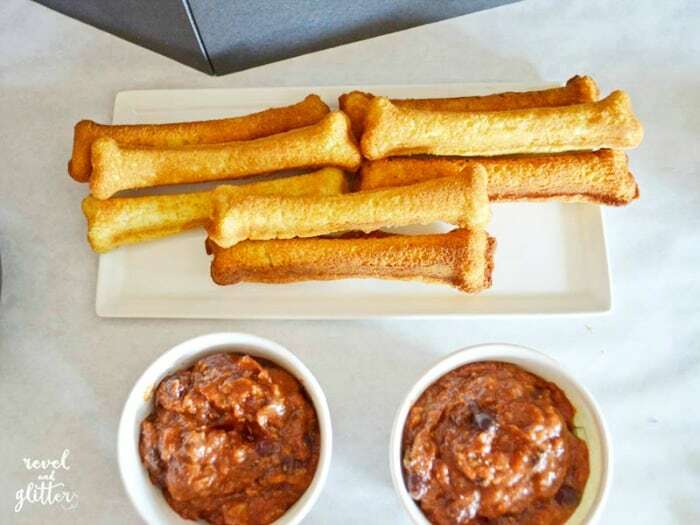 Instead of regular cornbread, how about baking them in a great bone cookie pan like this one from Wilton? Now, everyone is full, warm and ready to hit the streets! Need more party inspiration? 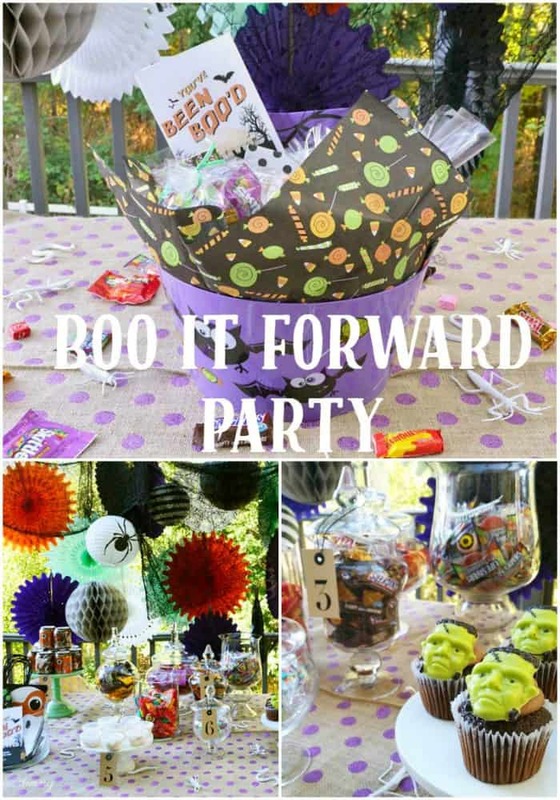 How about hosting a BOO It Forward Party? It is a fun way to surprise friends or neighbors and get everyone into the Halloween spirit! 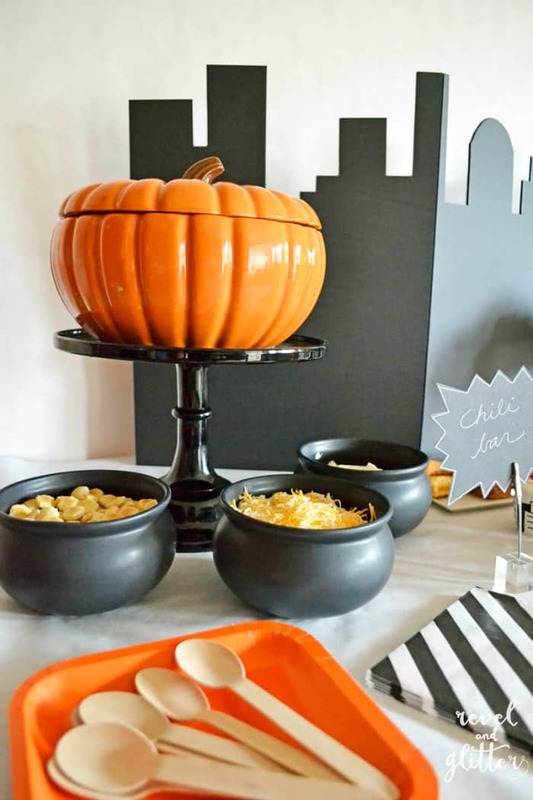 We’d like to send a big THANK YOU to Dawn of Revel & Glitter for sharing this fun Halloween idea with us. Over on Dawn’s blog you’ll find plenty of party ideas for all of life’s celebrations. I hope you’re ready to plan a party because she’s sure to leave you inspired! Be sure to follow her on Facebook, Pinterest and Twitter for even more creative ideas.